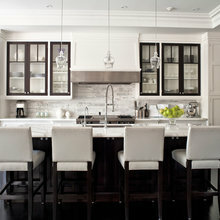 The Kitchen Company is a kitchen design firm that supplies kitchen cabinetry. Priced above is the average range for a complete kitchen remodel including cabinets, appliances, counter top, and installation. Prices vary depending on the scope of the project. 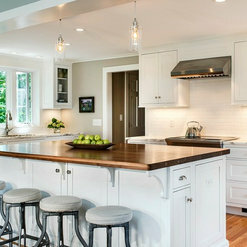 Very happy with our kitchen redesign with The Kitchen Company! After we had a water disaster that destroyed our kitchen, we knew we wanted to do something different with the space. Ron at the Kitchen Company helped our reimagine the space, listened to our goals, and made it all happen. End result is brilliant! 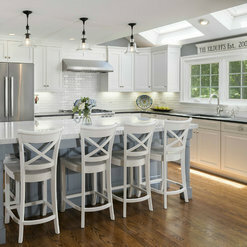 We worked with Julie to remodel our outdated kitchen with the goal of achieving a clean and lean white classic kitchen that retained elements of our preferred style, traditional. Julie seemed to understand from the start of our project what we wanted (maybe better than we did initially). She worked tirelessly and patiently with us (and always had a smile) to make our dream kitchen happen. Julie was always full of ideas and happy to rework something over and over again to get it just right for us. She was also incredibly responsive to our questions; she got back to us promptly with needed information and suggestions and was willing to accommodate our schedules for meetings. She was as invested in and as enthusiastic about our project as we were and even stopped by our house regularly to monitor its progress once it began. When a problem arose, as one always will when under taking a big task, she solved the problem on our behalf. 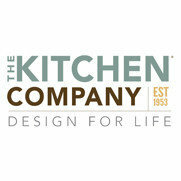 We highly recommend the Kitchen Company for its beautiful kitchen design/ products/designers. It was a pleasure working with the KC and Julie. We love our kitchen with its white Brook Haven inset, soft close cabinets with polished nickel hardware, mitered edged quartz countertops, walnut accent countertops and all of its many custom design elements (i.e. 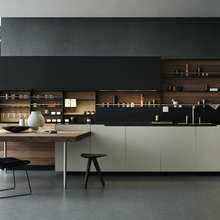 pullouts, appliance garage, spice drawers etc..! It might just be too pretty to cook in! My kitchen had to be gutted down to the studs. 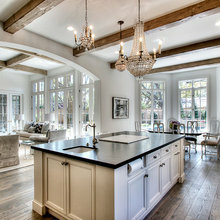 John Fecke worked with me to create the exact kitchen I wanted. He was very responsive and responsible. I am so happy with the work that was done. The attention to detail was excellent. I am very happy with the results. Thank you so much for your kind review. We've passed it along to John and everyone else in the office. We're so happy, you're happy. 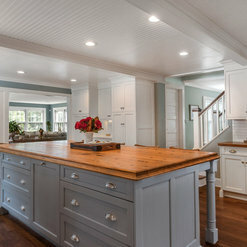 I found Kitchen company on houzz after checking many other kitchen companies. It was a great choice as my wife and I are enjoying our new kitchen. John was very nice of explaining every single details of his recommendations and discussed the best options. Even the price was not as expensive as other companies offered, so I was able to meet my budget with high quality kitchen. 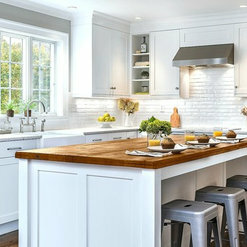 I really recommend John and the kitchen company to whoever is considering kitchen renovation and new cabinets. I've passed it on to John and the rest of the team. We are so grateful for your business and your support. Working with Gail from the Kitchen Company was the best thing that happened to me during the process of building our new home. Gail helped me to see every aspect of what the Kitchen would look like and helped me transition from a traditional look to a more modern one. I can't begin to tell you how happy I am with the results. The expert craftsmanship and professional customer service went beyond my expectations. Gail was patient and always there for me. Can't thank her enough. Thank you so much Loretta for your lovely review. Gail was an professional and an absolute joy to work with. Instantly she understood what I wanted to do. She was on top of all the people who remodeled my kitchen and was a stickler for perfection. I never had to worry. I absolutely love my new kitchen and laundry room. I would highly recommend Gail and The Kitchen Company. Working with Gail at the Kitchen Company was a complete pleasure from start to finish. She was professional, knowledgeable and possessed a great sense of style. Gail listened attentively, understood our vision and respected our budget. 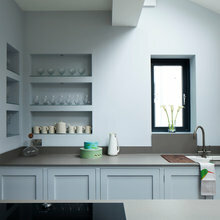 The result was a beautiful, functional kitchen beyond our expectations. This is my 3rd kitchen with Gail at the Kitchen Company. Each one was a unique experience and Gail helped me with so many aspects. She listens and asks many questions so she can accommodate within budget what my expectations are. Thanks AGAIN Gail!! Thank you so much Wendy for your review! We're glad you keep coming back! 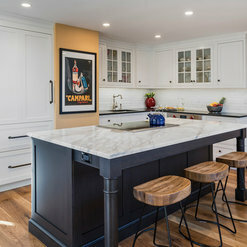 John Fecke from the Kitchen Company worked with my wife and I to renovate our kitchen after a flood. The work done was terrific. John presented us with excellent options to consider for the renovation, came to our house to take measurements, and provided an overall plan for the work. He also recommended a local contractor who did an outstanding job in coordinating work done on the floors, walls, electricity, and plumbing with the different installation jobs scheduled. We couldn't be happier with John and the Kitchen Company and have already recommended them to several friends. It means a lot to John and all of us here that you had a great experience. John Fecke and his team were fantastic throughout our project. John is a master at looking at possibilities and his attention to detail made this renovation go very smoothly. 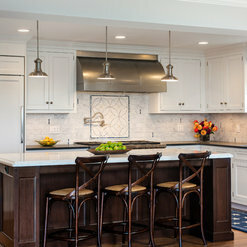 The Kitchen Company delivers on it's promise both from a quality and timeliness perspective. Our installation team treated this project as though they were doing the work in their own home. John's advice to us (we functioned as the General Contractor) really helped in terms of putting together a project/timing plan and schedule all of the other contractors (demolition, electric, plumbing, floors, paint and tile). Five stars for the Kitchen Company! Attached are a few "before" and "after" pictures. What a difference! Thank you so much for your wonderful review. John and the rest of our team really appreciate it and we're so glad you had such a great experience working with us! The people at The Kitchen Company are the best I've met. The Designers are very talented people that consider your budget and listen to your ideas and hopes. Excellent company to work with. Thank you so much Melinda! Our clients are the most important thing to us and we're so glad that you had such a positive experience. Thank you for taking the time to write this review. The team at the Kitchen Company excelled in effort and great ideas. Julie helped me obtain the kitchen of my dreams. All my question were always answered within a reasonable amount of time. Great ideas were suggested that I was not even aware I would consider. 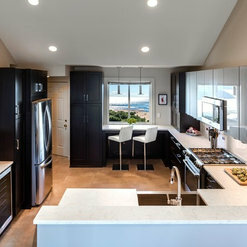 Installation of the cabinets and appliances was done at a very professional level. Thank you so much for your review Diane. 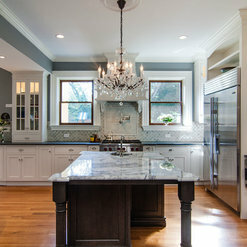 We're so glad Julie and the rest of our team was able to help you create your dream kitchen!